I voted for Bernie Sanders this morning in the California primary. Come November I will vote for Hillary Clinton in the general election. That doesn’t mean I’m giving up on the “political revolution.” On the contrary. That revolution is not the blood-in-the-streets kind that some stubborn anti-Sanders critics claim is the only kind there is, but rather a non-violent upheaval, a transformation that frees our system of billionaire, white-supremacist governance from the bottom up. Non-violent but never passive. Peaceful but not non-confrontational. Bernie Sanders will presumably continue to be an important part of that transformation. Nobody, not even Sanders, expected he would succeed as amazingly as he has. Yet he will arrive in Philadelphia with more delegates than any insurgent campaign in a very long time. His campaign’s list of backers contains the names of 2.4 million people who have contributed more than $200 million to his campaign. On social media, he has some 9 million supporters. That’s a potentially powerful base, especially if those on it who were not already politically engaged before the campaign can be persuaded to stay engaged. But Sanders didn’t initiate the transformation. And it certainly will not end when his candidacy ends, either tonight or next Tuesday in D.C. or in Philadelphia after the formal vote on the nominee is taken at the Democratic Convention. Occupy Wall Street, Black Lives Matter, LGBTQ activists, 350.org, the Fight for 15, nurses and teachers organizing, the Moral Monday Movement, and Moveon.org arejust a few of the many movement elements of that transformation—some successful, some not, all of them feeling their way along, smeared by media narratives, hindered by internal divisions, and tactically flawed—though their various critics, left and right, have different views on what the specific flaws actually are. These movement organizations are a big part of transforming both attitudes and policies and thereby the breadth of the national conversation. Without them, Sanders’ candidacy would not have been possible. The campaign built on their hard work, drawing volunteers and staffers from their ranks. Since the issues that brought forth those movement organizations have not been resolved, they and other newly formed organizations will continue to mobilize people to fight for systemic change. Because the Democratic Party has for so long been moving in a bad direction in several matters, the fight to transform it will continue as well. But for the next five months, we Sanders, Clinton, O’Malley and none-of-the-above activists have a golden opportunity. Because Donald Trump’s sketchy candidacy can turbocharge our efforts to knock Republicans out of office and reform our own party. However, we’ll have to suppress some of our differences, chill our internecine partisanship, and bite our tongues temporarily to make it happen. After 50 years of moving the Republican Party ever more rightward, ever more whiteward, the logical extreme has been reached. Donald Trump, carnival barker and snake oil salesman, the first major party candidate about which The New York Times felt the need to discuss the “f” word—fascism—will be the GOP nominee unless he decides he’s tired of the act he’s been performing for the past year and abandons the party at the convention door. Fascism is not a word to be used lightly. In the 1960s, some on the left practically made a joke of the label, promiscuously attaching it to anybody or any policy they disagreed with. So I’ve always applied it with extreme caution. Nonetheless, while Trump may not mesh perfectly with definitions of fascism, there’s more than a whiff of the brownshirt in his public pronouncements. Those along with his relentless lying, misogyny, racism, anti-Semitism, and general know-nothingism make him a rich target for the kind of devastation Clinton and Elizabeth Warren have dished out recently. A full-bore crushing of his candidacy could inflict collateral damage on the GOP all the way down the ballot. With wealthy donors saying they won’t support Trump, leading Republicans saying they won’t vote for him, and the candidate’s continual dissing of groups of people from which he might otherwise get at least a few votes, Trump faces an uphill battle against Clinton despite the high percentage of Americans who view her unfavorably. With that in mind, supporters of Clinton and Sanders and O’Malley should join not merely in defeating but in demolishing Donald Trump’s candidacy and, in the process, damaging the Republican Party in Congress and the state legislatures by hanging the man’s contradictory statements around the necks of every candidate who says they support him. Defeating Republicans who might not otherwise be vulnerable this year can open doors for those desperately needed Democratic Party changes. Bernie and those of us who support him can do a lot to help deliver this victory. The senator should spend the months after the convention barnstorming in support of the best candidates, including the dozens that berniecrats.net has identified as being transformationally minded. Each Sanders supporter should “adopt” a down-ballot candidate, a transformative person running for, say, a state legislative seat. We need to build that deep bench of experience in governing at the local and state levels anyway, and a presidential year like this one could mean significant gains in those arenas. These candidates should get our time, our money, or whatever support we can provide. Sanders should continue to deliver his galvanizing, vital, and yes, angry message about the perniciousness of concentrated economic power. While Bernie has supporters in all age groups, the most avid are young people, including women and young people of color. If anyone can, he can persuade them not to make the mistake of staying home on election day even if that means many of them feel they must vote with a clothespin firmly in place. All that, plus Sanders’ effort to get platform concessions passed or promised at the convention, is the inside strategy. But as reformers have known from the time the Quakers went to Congress in 1790 seeking to end slavery, transformational change requires both an inside and an outside strategy. Despite the “democratic socialist” label and an endorsement from the Democratic Socialists of America—an organization (full disclosure) of which I have been a member since 1982—Sanders himself is not a socialist, as many observers here and elsewhere have noted for the past year. He is a social democrat and not even a radical one. The ideas he has pressed forward, like universal health care, paid leave, free college tuition, and a more substantive social welfare system are only radical in the United States. Several organizations hope to capitalize on that leftward movement and do some moving of their own. Included among them are the Occupy Democrats, the Brand New Congress, the Working Families Party and the People’s Summit, an alliance of National Nurses United and People for Bernie, which will gather in Chicago June 17 to 19. The People’s Convention in Philadelphia [is] a grassroots attempt to reclaim our democracy by uniting behind a common policy framework, rather than a personality or party. 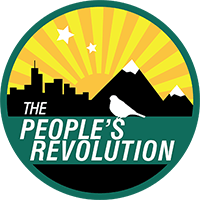 Leading up to our first People’s Convention this summer, grassroots organizers from around the country will work together to formulate a People’s Platform: a unifying set of ideas, beliefs, and values that will help define the movement. This platform will also serve as a critical mechanism to hold elected officials accountable; public representatives who pledge to uphold this platform, but fail to do so through their votes and other public behaviors, will no longer be eligible to seek endorsement or support from The People’s Revolution. That prompts lots of questions, beginning with how Brand New Congress can possibly win with progressive candidates in deep-red districts. Exley says the strategy is still up for discussion. And while the group may have set a hugely ambitious goal, I’ve met too many accomplished Sanders organizers in too many states who told me their only contact with campaign headquarters was “a visit from this guy Zack Exley” to dismiss the effort out of hand. One big argument among left-of-center activists for what seems like millennia has been whether inside or outside strategy is the better approach. To reiterate, they both are essential. Both working in tandem has been the way almost all transformational reforms have been achieved. Working together now to trample Trump’s campaign and spread the pain to down-ballot Republicans doesn’t mean the struggle to bend the Democratic Party in a better direction is over. That fight is existential, so it will continue. But calling a truce while we pulverize the Trump candidacy benefits all of us. A Trump victory will harm us all. And not just a little bit. We should deploy this gift Republicans have given us like the wrecking ball it is.